Sustainability or green building is thankfully getting more popular today. 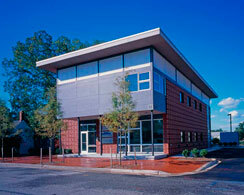 Torchio Architects have been creating “green” buildings since our beginnings in the early 1980’s. We feel that sustainability should be common practice, no less important than a sound structure or a leak-free roof. Torchio Architects are members of the U. S. Green Building Council and its principal Greg Torchio is a LEED Accredited Professional. His commitment to green building is manifested in the Torchio Building which houses the firm’s office. This project is registered with the USGBC and is pursuing Silver certification under USGBC’s LEED (Leadership in Energy and Environmental Design) program. This building is proof that Torchio Architects not only “talks the talk” but also “walks the walk” when it comes to green building. Green building requires an integrated approach during the design and construction process. Torchio Architects uses a collaborative team approach where the owner, architect, civil, structural, mechanical, and electrical engineers, landscape architects, interior designers, commissioning agents and contractors are brought into the design process as early as possible. This team approach assures a thorough analysis of potential green strategies and increases the likelihood that the green goals and objectives will be met.